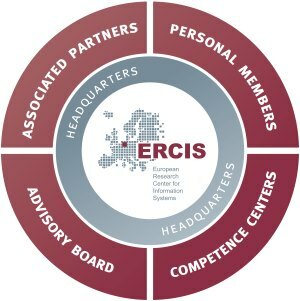 The European Research Center for Information Systems (ERCIS) is a lively international network of research institutions, active personal members and advisory board members working in the field of Information Systems. As we all have different research topics we work on, the different perspectives on current questions and "hot topics" allow the unique and country-spanning multi-disciplinarity. The network is organized and managed by the headquarters located in Münster, Germany. In addition, we have associated member institutions from all over the world as well as international personal members and a set of companies (our advisory board) we collaborate with. Certain research topics are bundled in our competence centers. The Headquarters in Münster, Germany, provides the infrastructure for a lively international academic network. We have partner institution all over the world. In addition to research institutions world-wide, we have several dedicated researchers working with us. A network of practicioners working with us. We have different areas of expertise, organized in our competence centers. Are you interested in becoming part of the network? The coordinating team is located at the ERCIS headquarters in Münster.